The Songkran Festival is the Thai New Year Festival. This year they are celebrating the start of the year of the Rooster. To say that they celebrate in style might be an understatement. Think of your wildest new year’s eve party, multiply it by 4 days, add in water guns, buckets and hose pipes, and you’re starting to get the picture. I was lucky enough to be in Chiang Mai for the start of the festival and I decided to brave a day out in town on the Thursday, the first official day of the festival. On my way out, I put all my belongings in my waterproof bag, I found a plastic cover for my iPhone and I was ready to go. (That’s also why the sound quality on the clips is pretty bad). A taxi came to pick me up, it was setup like Dexter’s kill rooms, covered in plastic sheets. 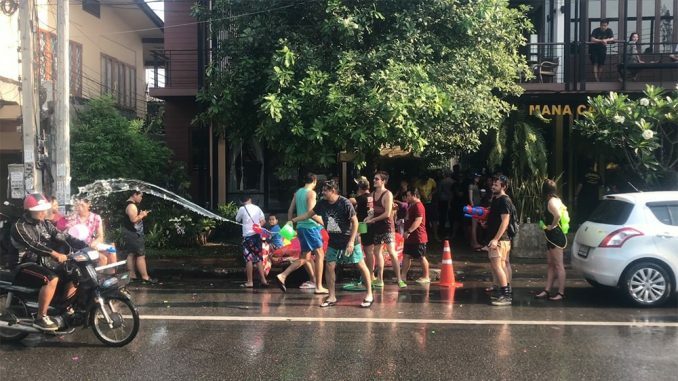 This is standard practice during the Songkran, as EVERYONE gets soaked, locals and tourists alike, everyone gets involved. A walk around the town, 6 hours or so, of solid water fights, buckets of ice cold water being poured down your back and over your head. The part that shocked me the most, people launching buckets of water in the faces of scooter riders as they went along the road. No one is safe. Everyone is fair game. In a car, shut your windows, in a Tuk Tuk, you’re really screwed. At one point, someone actually stepped out in front of our Tuk Tuk, stopped the driver and everyone on the road side had a field day. It was like a pride of lions stopping a zebra for directions before pouncing on it. Anyways, enough about the day, take a look for yourself and let me know what you think! If you celebrated Songkran this year, where were you and what was it like?